Hi Friends, I am offering my very first paper share!!! I am so excited to share all the beautiful DSP from the upcoming catalog. This is the perfect way for you to test drive the new designer series paper without having to purchase it all and not pay full price! That’s 84 Sheets of 6 x 6 Designer Series Paper from the 12 NEW packs of Designer Series Paper. In the new Stampin’ Up! 2018-2019 annual Catalog. You’ll receive 60 sheets that measure 6 x 6. The cost is $32.50 + 7.20 in Priority Mail Shipping and it includes the following. If you live local we can do a local pick up so no S&H will be charged! 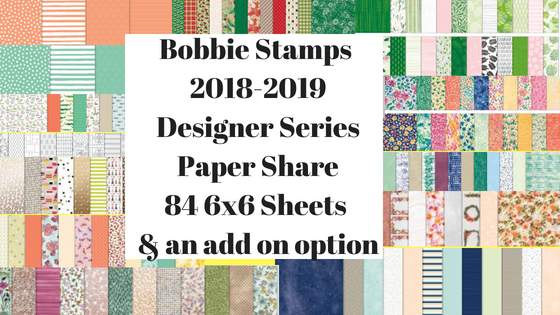 Ready to get your hands on some beautiful paper and participate in my very first Designer Series Paper Share? Email me at lbmd07@gmail.com to let me know you have registered. Let me know the number of shares you want and if you want the Add-On option. You must reserve your shares by May 25, 2018. I will send out your PayPal invoice no later than May 26, 2018. I will place my order with Stampin’ Up! on June 1, 2018, for everyone that has paid. As soon as the paper arrives, the DSP packs will be cut, sorted, and shipped out Priority Mail. I expect this to be mid-June. If there’s a backorder on any of the Paper, this could delay the shipping! I will notify you via email if this occurs. As a Stampin’ Up! Demonstrator I am not allowed to cash and carry Designer Series Paper. If you are expecting delivery immediately, it is not an option.